Comedy A-lister Carlos Mencia is set to take the stage at Comedy at the Carlson! His trademark witty observational take on society has captured audiences for decades. Mencia has taken his place among comedy greats and his show Mind of Mencia has seen critical acclaim. The Honduran native first came onto the scene performing at open mic night for The Laugh Factory in Los Angeles. Upon receiving positive feedback and high praises, Mencia decided to pursue comedy full-time. He soon went on to perform at The Comedy Store and later had appearances on In Living Color, The Arsenio Hall Show and Comedy Central! Mind of Mencia is where Carlos became a mainstream name. The half-hour special offered a mix of sketch comedy and stand up. The show garnered positive reviews and was Comedy Central’s second highest rated show, following only the paramount South Park in viewership. Mencia has also been featured in popular movies such as The Heartbreak Kid and Our Family Wedding. Not for the faint of heart, his comedy pushes the envelope and gets straight to the matter of controversial topics in politics and society. From poking fun at questionable American values to taking politicians down a few pegs – Mencia takes no prisoners. His uncanny ability to unite people in laughter with dripping satire and reality-based observations make his show a can’t-miss event! Get your tickets now and see a comedy great this weekend at Comedy at the Carlson from November 29th – December 2nd. Weekend events are held at 7:30 PM and 10:00 PM, with Thursday offering a 7:30 PM show. Be on the lookout for upcoming shows! 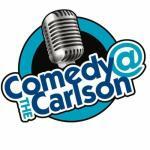 Comedy at the Carlson has recently announced the legendary Bob Saget will be taking the stage in February. Check those difficult-to-buy-for people off your holiday list early and give the gift of laughter!